Note: This post has been updated as of October 2018! This seemed like a good time for The Ashley to take a look at all of the ‘Teen Mom’ franchise babies…by the numbers! We need a counter for that. She says “Dude” ALOT! What the HELL kind of name is Saychelle??!! I have pcos and I really don’t think she didn’t know that far along, since she had 2 kids already and they move around alot sooner with each pregnancy .I’m going more with denial ,but it’s easier to use the pcos excuse . I think the interesting thing about these Teen Moms or people with PCOS and other issues is this- I have PCOS and my doctors (multiple OBs and fertility doctors) have always said it might be difficult to get pregnant and risky but NO ONE has ever said you’re infertile, don’t worry about using contraceptives. I feel like people use this as an excuse. People might disagree with me but I feel like most doctors aren’t that careless with their words. I also have PCOS and Maci makes me really mad when she talks about it. This is just an excuse. Her story about whether or not Jayde was planned changes all the time. First she said she was told she couldn’t have any more kids so she stopped using birth control (which birth control is always recommended for PCOS to help control symptoms and regulate periods). Later she said that her doctor told her that getting pregnant again might not happen because of it so she “didn’t want to prevent it any further” so they would just see what happens. Now when her PCOS is convenient to the storyline she says she “always struggles with it” but then she never mentions it again. chelsea “waiting” 7 years to have more kids isn’t special lmao, you could say briana also waited 6 years to have another kid and amber waited 9. it’s more due to luck than anything. No worse than West Virginnie Leah anise her Aleah, Allileah, and Addileah, plus whichever one is Grandmother Hialeah. Autocorrect ran wild with that! I kind of like granny Hialeah but was going for whichever kid is Gracieleah. Next one will be JesusGodLeah. Damn 80 minutes for Watson. Lucky girl! I was in labor for 39 before they realized my baby wasn’t coming out and decided to give me a c-section. All together I was in labor for 41 hours. Nova was born in January to Cate and Tyler. It says Teen Mom 2 babies that were born in January. When you really think about it, Cate was never a teen mom. She was a girl that was 16 and pregnant, but she wasn’t a mother. I was trying to figure out the math for the TM2 girls’ kids and realized I forgot Briana. I guess I don’t consider her an actual TM2 girl. She doesn’t even go here! I’m proud to say that today I officially unfollowed Farah on instagram ! Proud of you but I must ask…..why did you follow her in the first place????? Wtf would you follow her to begin with? 4,298,977,121 – Number of men Jenelle has practiced making babies with. Number of times Jenelle has been pregnant/married/engaged/found her soul mate/ been “done with her mom”/ threatened to quit should be a list in it’s own. 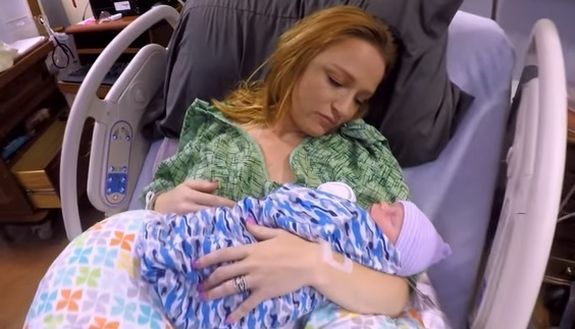 Number of beers Maci drank in the 5 months she “didn’t know” she was pregnant with Maverick?